It is a simple thought experiment. Would you rather invest in South Korea, “a world leader in electronics, telecommunications, automobile production, and shipbuilding,” or in North Korea, where “corruption is endemic at every level of the state and economy”? For over a decade, we’ve been advocating freedom investing, the idea that investing in countries rated high in economic freedom should produce better returns than investing in countries with more controlled or repressed economies. The factors that produce better economies have been discovered and re-discovered multiple times throughout history. Planned and controlled economies cannot allocate resources efficiently. A centralized planner cannot know and respond to all of the signals as quickly as when the problem is crowd-sourced via the free market. The Heritage Foundation took this finding and developed 10 measures of economic freedom to rank all countries for the past 20 years. It categorizes the countries into free, mostly free, moderately free, mostly unfree and repressed based on their score. In 2014, of the 178 countries with enough data to rank, only 6 received a score over 80% and were considered free. An additional 28 were ranked mostly free with a score over 70%. Only Hong Kong received a score over 90%. The average investor would find it difficult to rank countries without Heritage’s research. The United Kingdom, Sweden and Norway qualify as mostly free despite the common misconception that they are command economies. Spain, Portugal, France, Italy and Greece, in contrast, all fail the requirements of mostly free and receive the description moderately free. The United States used to rank free, but in 2010 we fell to mostly free. Despite having fallen more than any other country over the past few years, we still live in the 12th most free country in the world. Because of this high ranking and the fact that currency exchange is not an issue when you invest domestically, the United States is one of the most appealing countries in which to invest. Within our firm, in addition to having an entire asset class for U.S. stocks in our asset allocation, we also have many domestic investments intentionally represented in our resource stock category, such as U.S. real estate and energy. This results in more than 50% of our stocks invested in the United States. We also represent foreign stocks in our asset allocation. For that portion of the portfolio, we weight those countries ranked free over those that receive lower scores. In 2014, the free countries were Hong Kong, Singapore, Australia, New Zealand, Switzerland and Canada, hereafter called the “Free Six.” In 2014, the return of each of the Free Six indexes beat the return of the MSCI EAFE Foreign Index. However, you can’t invest directly in an index. You can only invest in a product that attempts to track an index. The return an investor actually experiences is the return of the index minus the expense ratio of the fund plus or minus the tracking error. As a result, using the net returns of iShares MSCI funds in U.S. dollars, an equal allocation of the Free Six (EWH, EWS, EWA, ENZL, EWL, EWC) beat the return of the EAFE fund (EFA) by 7.92% over 2014. MSCI computes returns for various countries as price, gross and net returns. Price returns do not include reinvested dividends and therefore do not reflect the total return available to investors. Gross returns do represent this total return. Net returns reflect what remains after the deduction of tax withholding at that country’s maximum appropriate rate. In some countries, such as New Zealand, companies pay their nondomestic shareholders a bonus to compensate for the tax credit distributed to domestic shareholders. Additionally, MSCI country indices are calculated in a country’s local currency as well as translating that currency back into U.S. dollars. This year that conversion hurt foreign stocks as the U.S. dollar appreciated against most currencies. Although the EAFE Net Index lost 4.90% when measured in U.S. dollars, it gained 5.67% when measured in local currency. The 10.57% difference between the returns was a result of currency exchange. During 2014, the euro and the yen dropped 12.09% and 12.10%, respectively, against the dollar. With everything measured in local currencies, the average return of the Free Six was 10.44%, outperforming the EAFE Index’s local return by 4.77%. As the dollar strengthened, the currencies of the Free Six held their value better. The worst currency loss of the Free Six in 2014 was fourth-ranked Switzerland with the Swiss franc dropping 10.29% against the dollar. Over 2014, the dollar strengthened an average of 12.79% according to the U.S. Dollar Index but only an average of 6.52% against the currency of the Free Six. Monetary freedom, a measurement of price stability (and freedom overall), is one of the 10 measures of economic freedom. Although “both inflation and price controls distort market activity,” providing a stable currency helps support a free market. This is just one more reason the Free Six make great investments. Over the past decade, the Free Six have seen a 8.24% return, the S&P 500 a 7.67% return and the EAFE a 4.43% return. Economic freedom matters. Even in 2014, a bad year for foreign investments, the Free Six boosted returns over the rest of the global market. 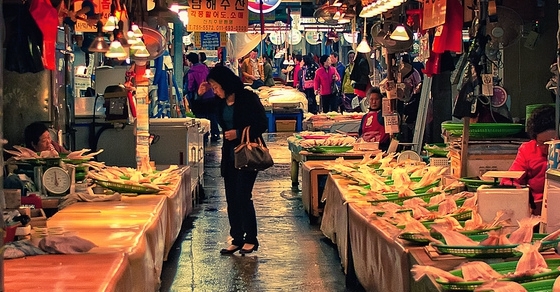 Photo of South Korea used here under Flickr Creative Commons. What Is The Correlation Of Freedom Investing?